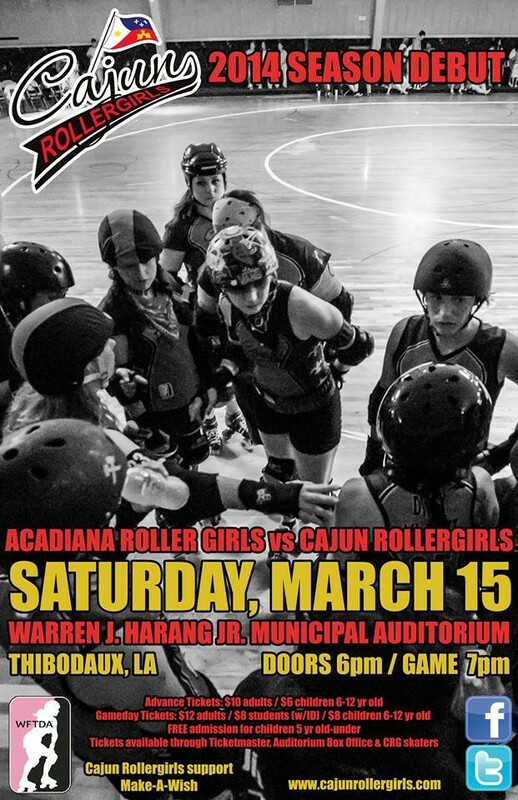 The Cajun Rollergirls will officially begin our 2014 regular season with a home contest against the Lafayette-based Acadiana Roller Girls on Saturday, March 15 at the Warren J. Harang Jr. Municipal Auditorium, 310 N Canal Blvd, Thibodaux, LA. Doors open at 6 p.m., with the game beginning at 7 p.m.
During halftime, Terrebonne Parish Senior Planner Chris Pulaski will discuss the Friends of Fireman’s Park Skate and Bike Park, currently under development in Houma, and other plans to create positive spaces and parks for skating, bikes, scooters and more. Discounted advance tickets for the event are available at $10 for adults and $6 for children age 6-12. Advance tickets for all Cajun Rollergirls home games are available through any Cajun Rollergirls league member, through Ticketmaster or through the Harang Auditorium box office. In addition, advance tickets are also available while supplies last at the following locations: Anela’s, 7720 Main St., Houma; Renaissance Family Fitness, 106 Southdown Blvd., Houma; and Whisper Weight Loss Center, 488 Corporate Dr., #9, Houma. Tickets at the door are $12 for adults, $8 for students with valid ID and $8 for children age 6-12. Children age 5 and under are admitted free.